I do not think it makes sense that there is a bar that caters specifically to people who ride bicycles. I've voiced this concern about OTB many times. I find it funny that bikers define themselves as a sub culture based on a mode of transportation. (I suppose they'd also spout off some nonsense about how I'm being superficial and there is so much more to the biker way of life.) Personally, I like to walk quite often. But I do not think a walking themed bar would be nearly as successful as OTB. Everyone I know claims to love the food at OTB. My old neighbor used to say they had the best salads ever and this dude I know named Carl eats there religiously. Personally, I have very little interest in the food at OTB. 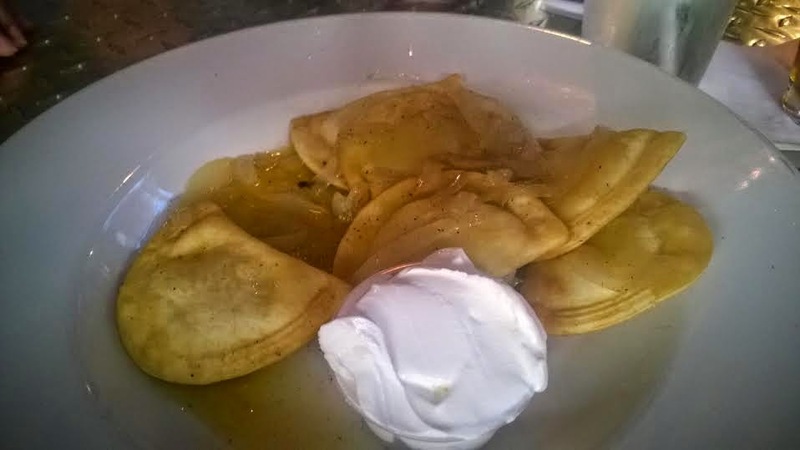 I'm pretty sure my happy hour pierogies were made by Mrs. T.
I don't want to come off as overly critical. I think OTB has some good beer specials and I certainly like the staff. ($3 Dales Pale Ale and our bartender looked like Miley Cyrus!) Also, the food is acceptable. I just don't understand the hype. Without the bicycle theme and the ample bike parking, I think this place would be out of business. These wings were way better than they looked. They did a nice job of achieving the perfect texture with the seitan. If you've never had seitan wings, I recommend giving them a try. 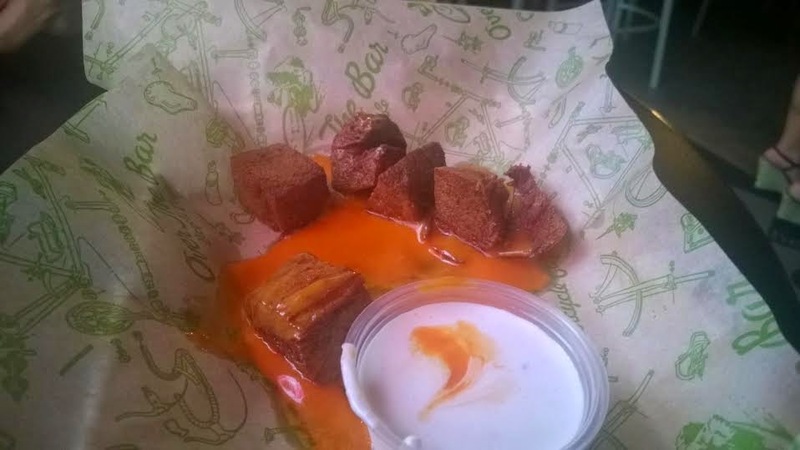 Although the chicken wing is the perfect vehicle to eat butter and buffalo sauce, crispy seitan can work quite well. Seitan should really just be called gluten, because that's what it is. A non-soy meat alternative made with wheat and often served as fake duck or tofurkey. Now get on your bike and ride!